I’m sure we all have these projects we see somewhere online or in a magazine that we can’t get out of our heads. Nicole of Modern Handcraft’s modern hexies kind of blew my mind. I had to try them immediately! This was my first time using paper templates and sewing hexagons. Making these hexies in front of the TV in the evening was very calming and satisfying, they add up quickly! And so it happened I found myself with a good number of hexies in all colours of the rainbow sooner than I knew. Most of them I made from scraps and then I cut some from my stash in the colours that were still missing. I had no concrete plans how to lay them out, and as I tried different arrangements I had the idea to make a map out of them. I have a thing for maps and so does my boyfriend. We have lots of them hanging around in our shared apartment, but he still needed one for his weekday-apartment in Switzerland! I proceeded to take a pic of a map on my phone and used this as an orientation when I laid out my map. 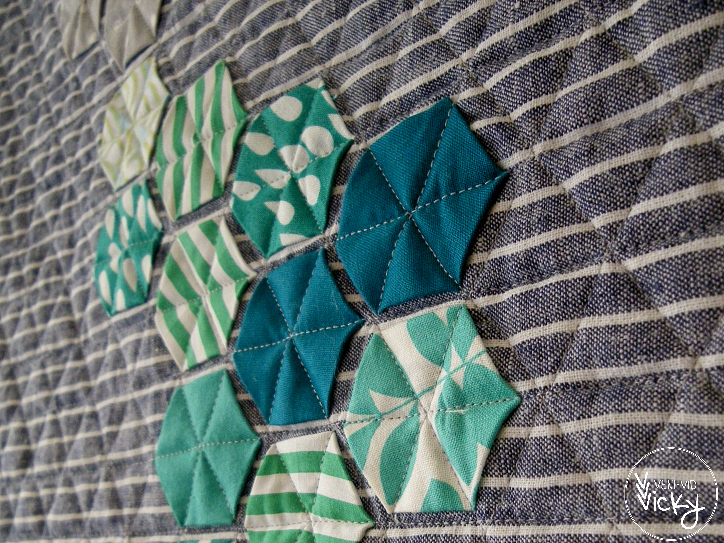 There’s a wonderful tutorial on the Modern Handcraft Blog for the modern hexies method. You can learn how to make hexagons with paper-templates (I printed and cut my own) on the Ellison Lane Blog. Think of a layout you would like to do and estimate how many hexagons you will have to make for it. For the world map I needed 117 of them and made them on two or three following evenings in front of the TV. My self-made hexagon templates are a little smaller than 1″ hexagons. My quilt finished at approximately 30 inch * 45 inch. You can find my read-to-print hexagon file here or use pre-cut 1″ hexies. Lay your hexagons out and start securing them to the background fabric with glue. Start with the center hexagon as shown in the pattern*. Leave a good amount of spacing between the hexagons, this will make quilting so much easier – 1/8 of an inch should suffice. Make sure to take out the paper before glueing down. (Yes, I almost forgot that step…) See Nicole’s tutorial for the exact way to do this. Baste your quilt sandwich. I used safety pins (as I always do) and pinned in the space between the hexagons. Start quilting! 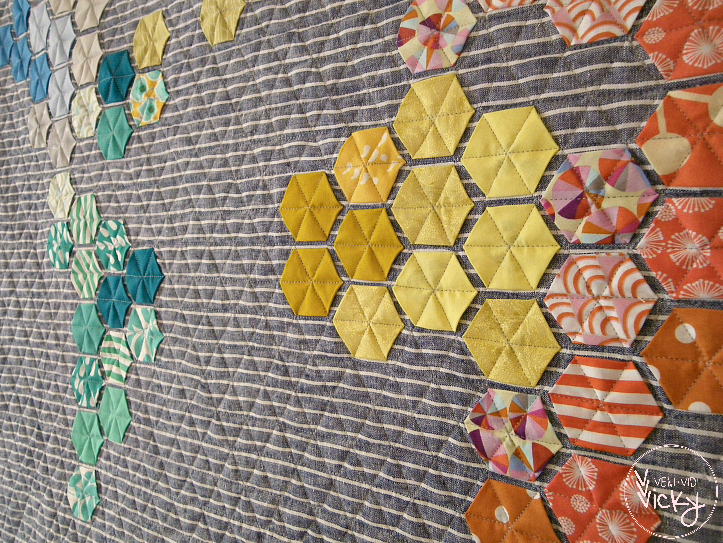 When you quilt over a hexagon, stretch it out flat with your fingers, so that the corners are pressed to the ground. Otherwise the corners might flip when the presser foot runs over them. To hang it on the wall, an easy way is to put a safety-pin in each of your four quilt corners, nail four little nails into the wall as you go, then hook the safety pins in. Start on one upper corner and have someone check the position from a distance before you put the second upper nail in. The nails in the downside corners help to stretch the quilt out on the wall. I’m sorry I don’t have any directional photos to accompany this. I didn’t have plans to write a blog-post about it originally. But all the wonderful feedback I got on Instagram made me think that some of you might want to try it out! If you do a hexagon map of your own, I would love to see the results under the Instagram hashtag #itsahexiworld. 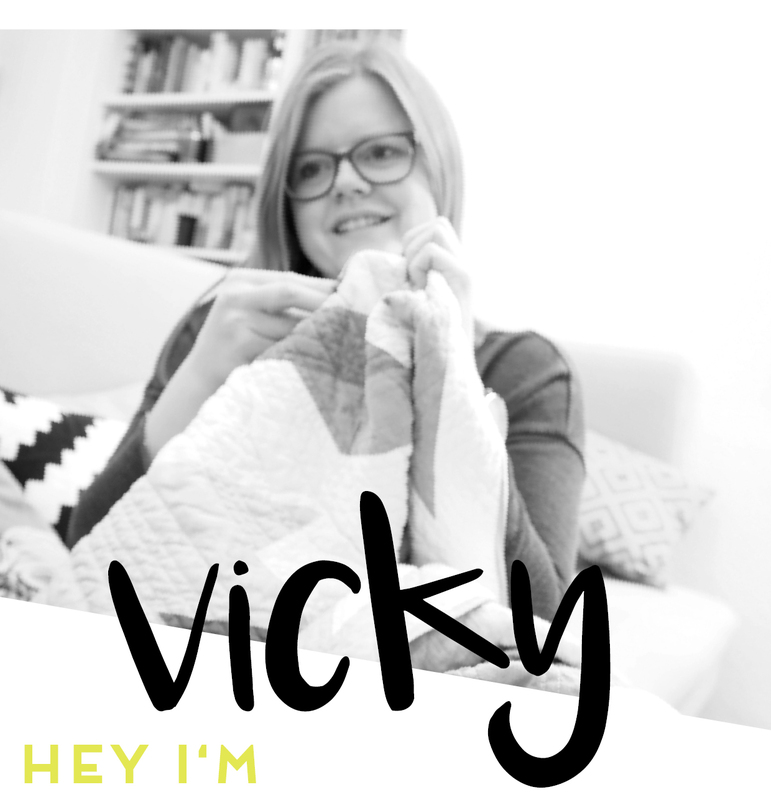 And don’t forget to tag them with #modernhexies as well. By the way, check that hashtag out for a collection of awesome projects on Instagram! Deine Weltkarte ist der Hammer! Vielen Dank fürs Teilen Deines Layouts. das ist wirklich lieb von dir, danke dir Kinga!! Super cool idea! Looks great! found you through the blogger’s quilt festival. I am in love with this quilt! Such a great idea and turned out beautifully! I am not a hexie person, but I am definitely thinking I need to give this a try! Its just gorgeous! Thanks for any other excellent post. The place else could anybody get that type of information in such an ideal way of writing?